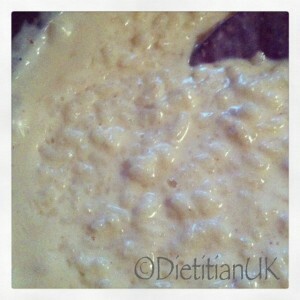 I’ve become a bit of a rice pudding addict of late. There is something about that creamy goodness that just appeals to me, I love it cold, straight from the fridge, either on it’s own or with some fruit. I usually buy it, but a bit of a shopping failure meant the fridge was bare. Myself and the toddler went shopping far too late in the day, both tired, we got round the shop, picked up all our items and then found long queues at the checkout. Neither small girl nor me were in the mood to wait around, she was on the verge of a mini melt-down, I had no patience and so we gave up! So later on I found some pudding rice in the cupboard and hey presto I’ve discovered just how easy it is to make rice pudding in my slow cooker, it’s a low fat version too and a whole lot cheaper than buying it. It took 2 1/2 hours but was literally a “bung it in, switch it on and come back later” recipe. Check it out. 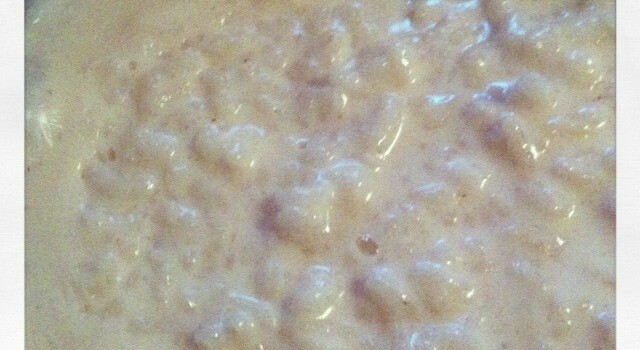 Easy, peasy, rice pudding, made in the slow cooker. Pop all the ingredients in the slow cooker, switch it on to high and leave it for 2 1/2 hours. It will thicken up slightly more and stay warm if you leave it switched off in the slow cooker for 15 minutes or so.